Get Lake Tahoe road conditions and driving directions before you head up. 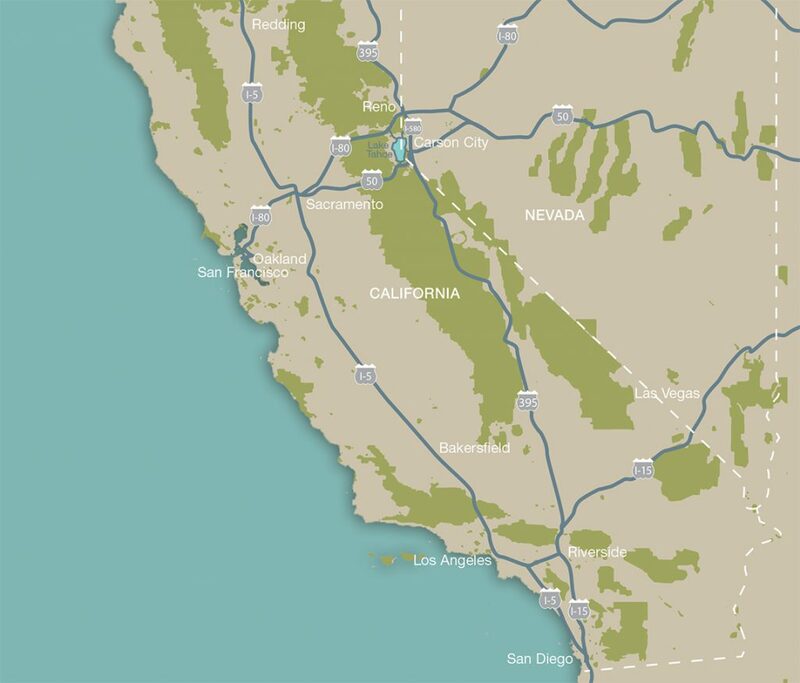 To South Lake Tahoe from the Bay Area, including San Francisco and Oakland International Airports, take I-80 to Sacramento. From Sacramento and its international airport, follow US 50 about 100 miles. Make a right on Lake Tahoe Blvd (US 50). To North Lake Tahoe from the Bay Area, take I-80 East through Sacramento to Truckee. To reach Tahoe City, take SR 89 South. To reach Kings Beach, Crystal Bay or Incline Village, stay on I-80 and take SR 267 East to SR 28. To South Lake Tahoe, from Reno and its international airport, take I-580 through Carson City (31 miles). Make a right on US 50 and continue about 25 miles. To North Lake Tahoe, take I-80 West to Truckee. Drive SR 267 East and SR 28 to Kings Beach, Crystal Bay, and Incline Village. Continue on I-80 and turn onto SR 89 South for Tahoe City. Looking for info about Lake Tahoe Beaches? Check out our Beaches Page!